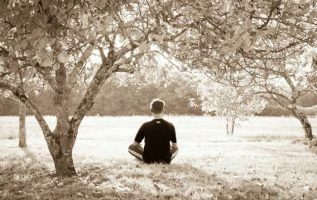 Those who have familiarized themselves with the Yogi teachings regarding the Instinctive Mind and its control of the physical bodyâ€”and also of the effect of the Will upon the Instinctive Mind-will readily see that the mental attitude of the person will have much to do with his or her health. Bright, cheerful and happy mental attitudes reflect themselves in the shape of normal functioning of the physical body, while depressed mental states, gloom, worry, fear, hate, jealousy, and anger all react upon the body and produce physical inharmony and, eventually disease. We are all familiar with the fact that good news and cheerful surroundings promotes a normal appetite, while bad news, depressing surroundings, etc., will cause the loss of the appetite. The mention of some favorite dish ill make the mouth water, and the recollection of some unpleasant experience or sight may produce nausea. Our mental attitudes are mirrored in our Instinctive Mind, and as that principle of mind has direct control of the physical body, it may readily be understood just how the mental state takes form in the physical action of functioning. Depressing thought affects the circulation, which in turn affects every part of the body, by depriving it of its proper nourishment. Inharmonious thought destroys the appetite, and the consequence is that the body does not receive the proper nourishment, and the blood becomes impoverished. On the other hand, cheerful, optimistic thought promotes the digestion, increases the appetite, helps the circulation, and, in fact, acts as a general tonic upon the system. Many persons suppose that this idea of the affect of the mind upon the body is but the idle theory of occultists, and persons interested along the line of mental therapeutics, but one has but to go to the records of scientific investigators to realize that this theory is based upon well established facts. Experiments have been tried, many times, tending to prove that the body is most receptive to the mental attitude or belief, and persons have been made sick, and others cured by simple auto-suggestion or the suggestion of others, which in effect are but strong mental attitudes. The saliva is rendered a poison under the influence of anger; mother’s milk becomes poisonous to the babe if the mother manifests excessive anger or fear. The gastric juice ceases to flow freely if the person becomes depressed or fearful. A thousand instances of this kind could be given. Do you doubt the fact that disease may be primarily caused by negative thinking? Then listen to the testimony of a few authorities of the Western world. “Any severe anger or grief is almost certain to be succeeded by fever in certain parts of Africa.”â€”Sir Samuel Baker, in the British and Foreign Medico Chirurgical Review. â€œI have been surprised how often patients withprimary cancer of the liver lay the cause of this ill health to protracted grief or anxiety. The cases have been far too numerous to be accounted for as mere coincidences.”â€” Murchison. “The vast majority of cases of cancer, especially of breast or uterine cancer, are probably due to mental anxiety.”â€”Dr. Snow, in The Lancet. “Eruptions on the skin will follow excessive mental strain. In all these, and in cancer, epilepsy, and mania from mental causes, there is a predisposition. It is remarkable how little the question of physical disease from mental influences has been studied.”-Richardson. “My experiments show that irascible, malevolent and depressing emotions generate in the system injurious compounds, some of which are extremely poisonous; also that agreeable happy emotions generate chemical compounds of nutritious value, which stimulates the cells to manufacture energy.”â€” Elmer Gates. Dr. Hack Tuke, in his well known work on mental diseases, etc., written long before the “Mind-cure” interest was manifested in the Western world, gives numerous cases of diseases produced by fear, among them being, Insanity, idiocy, paralysis, jaundice, premature greyness and baldness, decay of the teeth, uterine troubles, erysipelas3 eczema and impetigo. During times when contagious diseases are prevalent in communities, it is a well attested fact that fear causes a great number of the cases, and also causes many deaths in cases in which the attack is but light. This is readily understood when we consider the fact that contagious diseases are more apt to attack the person manifesting impaired vitality, and the further fact that fear and kindred emotions impair the vitality. There have been a number of good books written upon this matter, so there is no occasion for us to dwell at length upon this part of the general subject. But before leaving it, we must impress upon our students the truth of the oft repeated statement as “Thought takes form in action,” and that mental conditions are reproduced in physical manifestations. The Yogi Philosophy, in its entirety, tends to produce a mental attitude of calmness, peace, strength and absolute fearlessness among its students, which, of course, is reflected in their physical condition. To such persons mental calmness and fearlessness comes as a matter of course, and no special effort is necessary to produce it. But to those who have not as yet acquired this mental calm, a great improvement may be obtained by the carrying of the thought of the proper mental attitude, and the repetition of mantrams calculated to produce the mental image. We suggest the frequent repetition of the words “BRIGHT, CHEERFUL AND HAPPY,” and the frequent contemplation of the meaning of the words. Endeavor to manifest these words into physical action, and you will be greatly benefited both mentally and physically, and will also be preparing your mind to receive high spiritual truths.